With two weeks to go until the release of As If By Magic, I thought I would give you a little insight into what it’s like when I have a “writing day”. When I am working on something, I write every day without fail. I still have a day job and that means I spend much of the week grabbing an hour or two here and there to keep things ticking. I usually get at least one day a week where I have nothing to do other than write. Because I have to get up at 6am to go to work, I stick to a similar routine on a writing day and am up by 7am at the latest. I’ll usually make some coffee and quickly check my emails and tweets and then it is down to business. I am one of those horrible morning people Jessica so hates, generally thinking clearer and working better first-thing. Almost nothing has changed from writing Locked In to writing everything since. 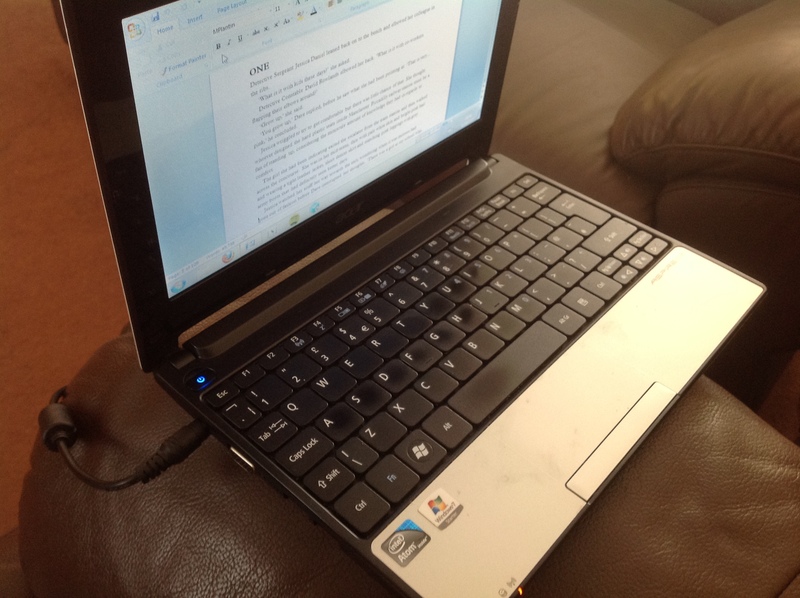 This is my cheapo little netbook. I’ve written almost everything on this. I don’t use a table, I write with it on my lap. The ‘E’, ‘A’, ‘S’ and space bar are particularly worn. Most of my writing is done from the corner of our slightly scuffed sofa. I suppose everyone has their own ways of working but what’s best for me is simply to get on with it. I’m quite disciplined and rarely get sidetracked. I’ll stay on top of my emails but not get involved with too much else during the day. When I started out writing, I needed it to be quiet but now I can work anywhere. As If By Magic was written at home, on trains, in hotel rooms, in a cafe, and on my lunchbreak at work. My first edit of Think Of The Children was completed on a plane. At home, I quite often leave Spotify running in the background. Most of As If By Magic was written with Oasis on a loop (I know they’re not on Spotify but I imported the tracks) and a bit of Noel Gallagher’s High Flying Birds for good measure. I once listened to that album on shuffle/repeat for ten hours straight. I drift between all sorts of music; everything from classic rock to John Williams and Hans Zimmer soundtracks. At the moment, I am into country. It’s a bit non-British, I suppose, but country music often contains brilliant pieces of storytelling. Listen to something like Sara Evans’ Suds In A Bucket or Brad Paisley’s Mud On The Tires. And then there is the imagery of Postcard From Paris by The Band Perry. Or Toby Keith’s Beers Ago – a song where he chronicles the moments of his life by how many beers he has had since they happened. Like the song or not, that’s pure creativity. I love it. Anyway, that’s the interesting stuff. Aside from a mid-morning coconut ring or five (that’s not a euphemism), I basically just write. I’m lucky enough to have had a full-time job since I graduated and even before that I’ve worked in various part-time jobs through the later years of school and university. I’ve done overnight shifts, earlies, lates, 10-hour days, 12-hour days and so on. I’ve been in factories, call-centres and offices. I’m used to working, so a writing day is the same as any other. I’ll work all morning, stop to have something quick to eat, and then write all afternoon. If I’m in the mood, and my wife is off doing something else, I might even keep going well into the evening. It’s not that unusual for me to write from seven in the morning until seven, eight or nine at night. As for writing speed, it depends. If I’m starting something, it is slower and a bit harder to get into. When I’m into the final third, it is almost as if it writes itself. 10,000 words a day – or more – wouldn’t be unusual if I am in the second half of something and have a whole day with no interruptions. I wrote the final 13,000 words of Think Of The Children in one go. Part of it is that I’ve grown up using computers and am a very quick typist. And that’s it. I figure writing, like most things, is as complicated as you choose to make it. I plan something, then I work every day until it is finished. 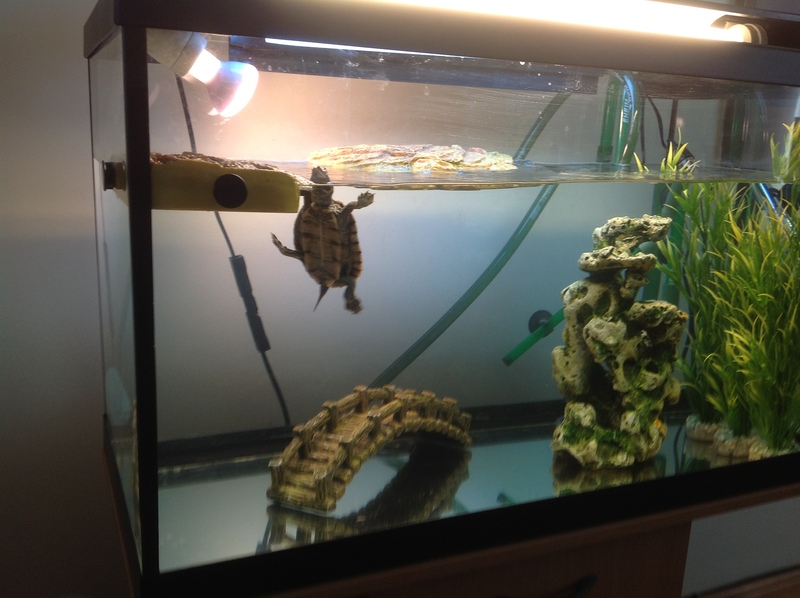 Not having children helps … although a greedy turtle begging for food (again, not a euphemism) can be quite distracting.